We recognize that your privacy is important. This document outlines the types of personal information we receive and collect when you use www.babies-and-sign-language.com, as well as some of the steps we take to safeguard information. We hope this will help you make an informed decision about sharing personal information with us. Www.babies-and-sign-language.com strives to maintain the highest standards of decency, fairness and integrity in all our operations. Likewise, we are dedicated to protecting our online visitors' privacy on our website. This information is collected if you request information from us, participate in an email course and/or sign up to join our newsletter email list or request some other service or information from us. The information collected is internally reviewed, used to improve the content of our website, notify our visitors of updates, and respond to visitor inquiries. You have the ability to accept or decline cookies by modifying your Web browser. However, if you choose to decline cookies, you may not be able to fully experience the interactive features of said site. Sometimes we use third-party advertising companies to serve ads when you visit our website. These companies may use information (not including your name, address, email address, or telephone number) about your visits to this and other websites in order to provide advertisements about goods and services of interest to you. If you would like more information about this practice and to know your choices about not having this information used by these companies, Click Here. This website is directed to adults; it is not intentionally directed to children under the age of 16. We operate our site in compliance with the Children's Online Privacy Protection Act, and will not knowingly collect or use personal information from anyone under 13 years of age. 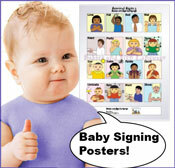 If www.babies-and-sign-language.com is sold, the information we have obtained from you through your voluntary participation in our site may transfer to the new owner as a part of the sale in order that the service being provided to you may continue. In that event, you may receive notice through our website of that change in control and practices, and we will make reasonable efforts to ensure that the purchaser honors any opt-out requests you might make of us. The images, commentary, instructions, and all other material on this website are not public domain. All content on the Babies and Sign Language/Little Hands Express © (www.www.babies-and-sign-language.com) website is fully copyrighted and may not be reproduced in print or electronic form without written permission from its creator(s). Some pages on the Babies and Sign Language/Little Hands Express website may include a scroll box at the bottom of the page containing HTML for a link to the page, which you may copy and paste onto your website or blog. You are not required to use that specific HTML code in order to link to those pages. However, in no case do we allow you to directly link to the images on our site or embed or frame our HTML code on your site(s). DO know and understand that this website is registered with the Library of Congress, therefore we have legal action-taking rights to bring offenders of this copyright to court immediately. As you can see by the US Copyright Laws, we are within our legal rights to sue copyright violators for damages from $1,500 up to $4,500. Moreover, we do and WILL take legal action. The easy route is to simply ask us for permission before attempting to walk off with our hard-worked upon content. Copy Right Notice / TLDR / Summary: Reproduction, distribution, republication, duplication, and/or retransmission of material contained within this www.www.babies-and-sign-language.com website and its variants are prohibited unless the prior written permission of www.babies-and-sign-language.com has been obtained. When we catch violator(s) of this copyright policy, legal action is taken against offenders immediately. Some links within this website may lead to other websites, including those operated and maintained by third parties. www.www.babies-and-sign-language.com may include these links solely as a convenience to you -- the presence of such a link does not imply a responsibility for the linked site nor an endorsement of the linked site, its operator, or its contents. 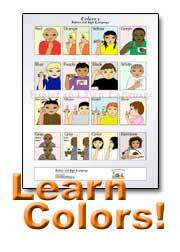 Thank you again for visiting www.www.babies-and-sign-language.com! In addition, thank you extra through supporting us via your visits and any purchases you make through linking from this site. We/I sometimes are compensated for our reviews and ad placements. I am greatly encouraged by your emails of appreciation to continue writing highly interesting, educational, and practical information for many years to come. We always want you to feel and look your healthiest! So again, thank you for your visits to this website. We add as much information as possible to this site, in hopes that it helps you in your challenges of fat loss, weight loss, and feeling your best. This free service is mostly possible though through the support of other volunteer fitness writers, professional trainers/authors, advertising fees, and referral commissions (received from review pages, pages with ad placements, and other products advertised on this site that you may have interest in, desire to learn more about, and/or wish to purchase). Babies and Sign Language/Little Hands Express is a personal website written and edited by me, MJ Williams and other independent baby signing trainers, writers, and infant/toddler/children educational collaborators. Please note that I/we'd never promote a program either that we have not tried ourselves, or that we know to be something that would possibly not work for you. The amount of money earned per referral is never the factor for my/our choice of which products to promote. Please note that I reserve the right to add or remove programs from this affiliate above list at any time. This website also abides by word-of-mouth marketing standards. I believe in honesty of relationship, opinion, and identity. As noted above, the compensation received does not influence the advertising topics or posts made in this website. Any content, advertising space, or post that is influenced by compensation should be identified as paid or sponsored content. If you have any questions about this disclosure, please contact me through the Contact Page. FTC Affiliate Disclosure / TLDR / Summary: Babies and Sign Language/Little Hands Express sometimes receives a small finder's fee as is a participant in a few to several baby/infant/children/etc affiliate programs. We also accept advertising fees from companies, businesses, and individuals who wish to see their ads on this www.www.babies-and-sign-language.com website. The materials contained on this website are provided for general information purposes only and do not constitute legal or other professional advice on any subject matter. This website, www.babies-and-sign-language.com, and its variants does not accept any responsibility for any loss or injury which may arise from reliance on information contained on this website, nor its electronic or paper guides, ebooks, hard cover books, etc. The materials on this site are for information purposes only, and most of all, these materials are here for your encouragement. The author of this website and anyone affiliated with www-babies-and-sign-language.com who distributes this information may not and will not be held liable for damages or injuries, mental, nor physical, nor emotional, nor psychological challenges, etc of any kind resulting from the use of this material. Before attempting to teach your child a language -- it is most highly recommended you consult with your doctor first to get clearance. Information contained on www.babies-and-sign-language.com is not intended to replace the advice that comes from a qualified medical practitioner, pediatrician, etc. Please be sure to get your OK from your doctor! As the publisher and one of the authors of this www.www.babies-and-sign-language.com website, I do not directly or indirectly dispense any medical advice or prescribe the use of any therapy contained anywhere in the pages of this website as a form of treatment for autism, Down Syndrome, the common cold, nor any other mental challenge or sickness. You must have a medical practitioner do this as such. Again, I do not nor do I intend to dispense, prescribe for, or diagnose any visitors to or at this website nor its variants (email courses, newsletter blasts, product reviews, etc). The reading material in the pages of this site should be taken as it is presented: as research, education, entertainment, and opinion only. I, the publisher (and one of several authors) intend only to offer signing, signal, and gestural information to help you stay encouraged. It is my/our sincere hopes that you succeed with the full collaboration and cooperation with your doctor (and/or other health/medical practitioner) in your mutual quest for as healthy-as-possible health, optimum health-being, and/or stable, successful little baby/toddler/child. Of course, in the event that you do you decide for yourself, and/or use any of the information from this website (or its variants) without your pediatrician's approval -- this clearly remains your (North American, especially) constitutional right. In the event of you residing in or within international waters or international land(s), your constitutional right may/might differ from those of the United States. No matter the case, I, the (said) publisher and we part-author(s) assume no responsibility (for any actions you may take from this said website or its variants). If you have any questions about anything on this page, please contact me through the Contact Page.